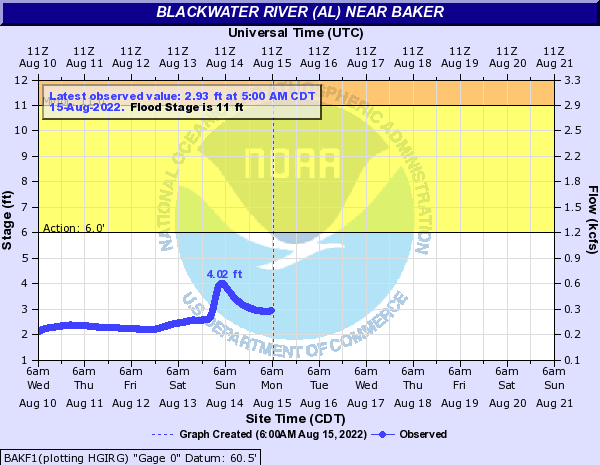 16′ Some residential flooding occurs downstream from Baker. 15′ Flooding of West Park and East Park in Baker will subside as the river drops below 14 feet. 14.5′ Flooding of West Park in Baker. 14′ Flooding of East Park in Baker. 12′ Flooding of secondary roads and lowlands will begin to subside. 11′ Minor flooding of secondary roads and lowlands from around Baker to downstream of Baker. 9.5′ Kennedy and Peaden Bridges are flooded upstream. 26′ Severe flooding will occur in Milligan. Water will be 6 to 8 feet deep over portions of U.S. Highway 90. 20.3′ Several homes on both sides of the river flood, (Antioch & Old Milligan) 3″ of water in several homes on Antioch Road. 19.1′ Water crosses Highway 90 east end of bridge. 18.5′ Widespread flooding in Old Milligan will subside as the level drops below 18 feet. 18′ Widespread flooding will occur in Old Milligan. Flooding of U.S. Highway 90 and the L & N railroad begin around 18 feet. 15′ Several homes in Old Milligan will occur and some evacuations will be necessary. 14.5′ Antioch road is flooded. 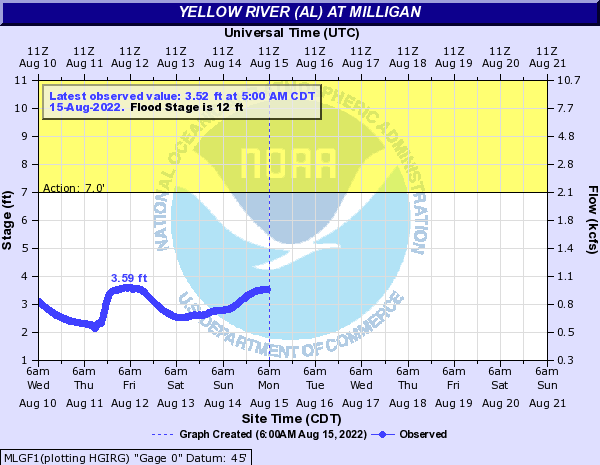 14.4′ Flooding in Old Milligan will subside as the level drops below 14 feet. 14′ Some houses in Old Milligan will become flooded and some evacuations could become necessary. 13′ Threatens home on Ellis and Antioch Roads. 12.5′ Flooding of lowlands will gradually subside as the river level drops below 12 feet. 12′ Extensive overflow of lowlands will occur and a few rural roads in the area will become flooded. 11.5′ Water flows over yards on Ellis Road. 9.9′ Some minor overflow of low lying areas will occur. Water will enter some yards along Antioch Road in Milligan. 5.9′ Water over Ellis Road at Trellis. 5′ Right bank overflows, mainly into swamp and marsh lands. 14′ Residential flooding in the Trevor Court area. 11′ Flooding becomes a threat to the Trevor Court and Rattlesnake Bluff areas. 10.5′ Flooding of trailers north of the Okaloosa Correctional Institute will subside as the river level falls below 10 feet. 10′ Some flooding of trailers north of the Okaloosa Correctional Institute. 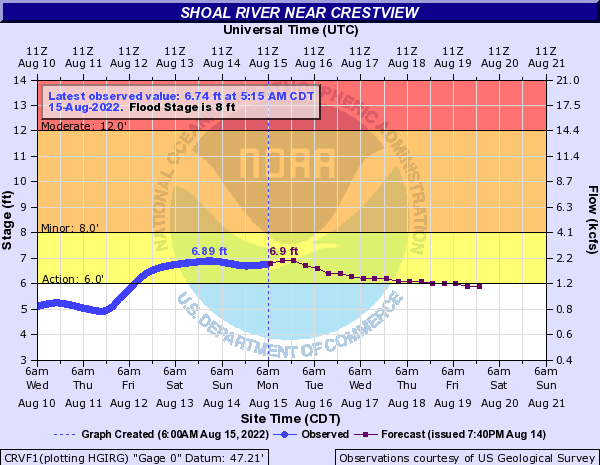 8.5′ Lowland flooding will diminish as the river drops below 8 feet. 8′ Minor flooding of low lying areas.